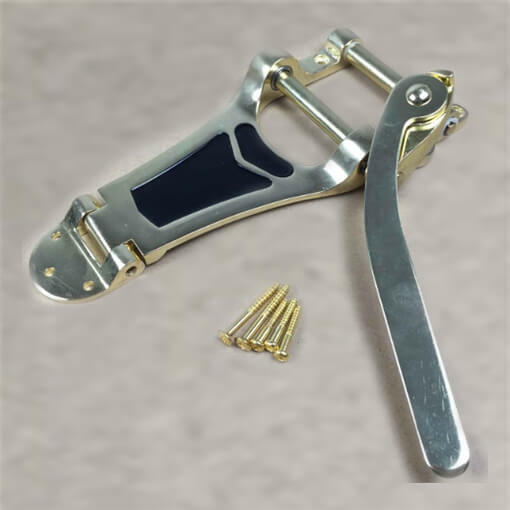 SouthAfricaB2B.co.za - Guitar Vibrato Bridge with Big Whammy Bar, Product by Xianyang Boya Music Instruments Co., Ltd. Guitar vibrato bridge of XYB is a big size type. Made of zinc alloy material. So the part is durable for using. With big whammy bar makes your guitar looks cooler. Besides, capable to manually make great vibrato effect. The part is a good choice for replacement of LP guitar and jazz guitar, etc. The delivered package includes: vibrato bridge with big whammy bar, 2 PCS of M4*35 screw and 3 PCS of M3.5*26 screw. We introduced chorm plating and gold plating for option.